One look at these Bandai Star Wars Movie Realization Figures makes us dream of a Star Wars/samurai crossover film. This isn't as much of a stretch as you might think: the Star Wars films already drew heavily from Japanese samurai cinema. George Lucas has long acknowledged that he was influenced by Akira Kurosawa films, to which the Star Wars films owe part of their visual storytelling and narrative elements. The word "jedi" itself is believed to be derived from the Japanese word jidaigeki ("period drama"), and parts of Darth Vader's suit design (especially his helmet) came from samurai armor. George Lucas even asked samurai film mainstay Toshiro Mifune to play the part of Obi-Wan Kenobi in A New Hope. Rumor is that when he turned the role down, he was then offered the role of Darth Vader. These figures bring forth an alternate reality where maybe Toshiro Mifune didn't turn down George Lucas's offer to fill the iconic role, and the samurai influences of the films were taken to the utmost extreme. Designed by acclaimed artist Takeya Takayuki, there's Darth Vader, as a feudal era samurai general, complete with a lightsaber katana and his distinctive armor given the full gusoku make-over. His helmet has been adorned with the Imperial insignia, now arranged in the elaborate "wa" style. 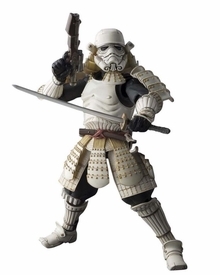 The Ashigaru (foot soldier) Stormtrooper's off-white armor gives you the distinct impression that it was intricately carved and molded from bone, and that it's seen many battles. Fully articulated with soft plastic parts, these figures are near-infinitely posable, so you can recreate any scene from Star Wars or your favorite samurai films.